When Apollo 17 lifted off from the moon 42 years ago this week, a camera captured the movements of the spacecraft — even though nobody was left behind to, say, establish a lunar base. How was that possible? The answer: With a camera on the lunar rover that could be controlled — or even programmed — from Earth. Pretty impressive technology for the takeoff 42 years ago on December 14 in 1972 — although it took three tries to get the technique right. 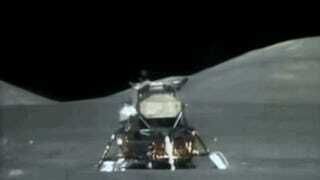 Here's the complete video of the Apollo 17 lunar takeoff. The action gets started at the 3:00 mark. Now, the way that worked was this. Harley Weyer, who worked for me, sat down and figured what the trajectory would be and where the lunar rover would be each second as it moved out, and what your settings would go to. That picture you see was taken without looking at it [the liftoff] at all. There was no watching it and doing anything with that picture. As the crew counted down, that's a [Apollo] 17 picture you see, as [Eugene] Cernan counted down and he knew he had to park in the right place because I was going to kill him, he didn't — and Gene and I are good friends, he'll tell you that — I actually sent the first command at liftoff minus three seconds. And each command was scripted, and all I was doing was looking at a clock, sending commands. I was not looking at the television. I really didn't see it until it was over with and played back. Those were just pre-set commands that were just punched out via time. That's the way it was followed.